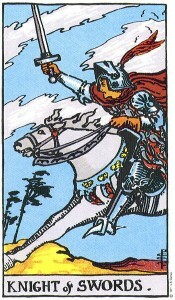 Charging forward with gusto, the Knight of Swords is ready to take on anything in his path with sword drawn and horse at a full gallop. He’s brave and courageous – and perhaps a bit foolhardy – but he is committed to his beliefs and ready to defend them at all costs. 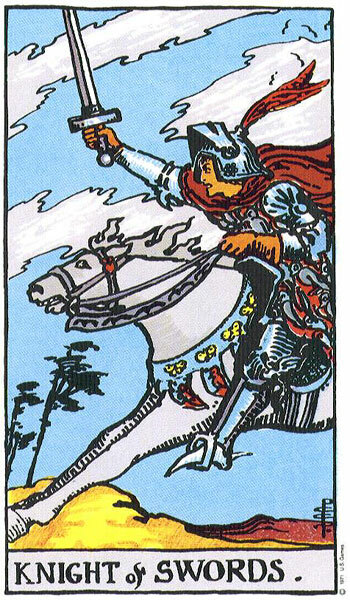 When not an individual, the Knight of Swords represents a whirlwind of activity–communications, social interaction, conferences, travel. Everything comes up in a quick gust…whether you’re ready or not! 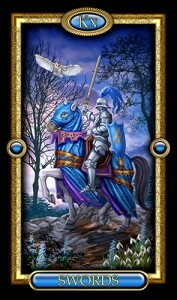 In a reading, stay focused and true to your goals. You communicate well, but you can at times seem a bit too forthright and sharp (though, let’s face it, your reasoning is solid.) Go after what you want! You could receive a message that introduces a flurry of activity, and your goals could suddenly manifest once you put your mind to their achievement. Be careful what you wish for… you could very well get it!